Six-month period to March 2014 will result in 22 GW of demand, equivalent to a new 5 MW solar farm installed every hour. 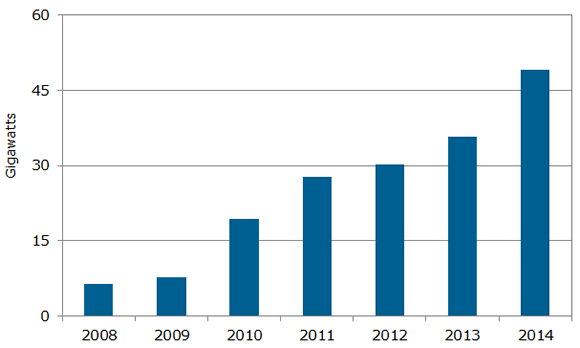 Solar photovoltaic demand is poised for explosive growth in 2014. Solar photovoltaic demand is poised for explosive growth in 2014, and is set to reach 49 gigawatts, up from 36 GW in 2013, according to findings in the latest NPD Solarbuzz Quarterly. Q4’13 will be another record quarter for the solar PV industry, exceeding the 12 GW barrier for the first time ever. Furthermore, demand in Q1’14 will also achieve record-breaking status, as the strongest first-quarter ever seen by the PV industry. Over the six-month period from October 2013 to March 2014, the solar PV industry will install almost 22 GW, which is greater than all the solar PV installations that occurred between 2005 and 2009, during the previous high-growth phase of the industry that was driven by the European market. This 22 GW of demand is equivalent to 120 megawatts (MW) of solar PV installed every day for six months, and equates to one new 5 MW solar farm being completed every hour of the day. The record solar PV demand in Q4’13 is heavily weighted towards the three leading countries for end-market demand today: China, Japan, and the United States. Two-thirds of all solar panels installed in Q4 will be located in China, Japan, and the US. The new record level of demand in 2014, along with increased outsourcing of solar PV wafers, cells, and modules to keep up with end-market growth, will drive production utilization rates above 90% for tier-1 manufacturers. By the end of 2014, many of the leading Chinese crystalline silicon module suppliers will be reporting silicon and non-silicon costs below $0.50 per watt. The resulting growth in operating margins will then provide a solid foundation upon which to guide new capacity additions that have been on hold now for 18 months. "Manufacturing over-capacity and pricing erosion within the PV industry was previously a key factor in limiting annual growth to 10-20% between 2011 and 2013,” added Colville. “With a more stable pricing environment and the prospects of increased end-market globalization, NPD Solarbuzz forecasts a return to annual growth above 30% for the PV industry in 2014”.